Though Abenomics has caused quite a stir and Japan’s economy has improved, the policies put in place will fail. Prime Minister Shinzo Abe so far has offered only fairly standard responses to Japan’s economic malaise. Similar policies, though they once spurred Japanese growth, have failed to renew Japan’s economy throughout the last two difficult decades. Unless Abe takes additional steps to deal forthrightly with Japan’s severe structural problems – to counteract the economic and financial effects of Japan’s aging population and address the economy’s lack of innovative dynamism – the recent growth surge will fade, and Japan will relapse again into stagnation. The prime minister has advertised Abenomics as entirely new. That is an overstatement. Two of its three elements, or “arrows” as he calls them, are little more than a repackaging of long-standing Liberal Democratic Party (LDP) postures. Admittedly, the prime minister, by calling on the Bank of Japan to engage in quantitative easing, has used more direct language than is typical and insisted on a new technique. But if the language and the particulars are new, demand for monetary ease fits well with common LDP policies to promote exports by depressing the yen’s value. Abe actually, if inadvertently, made the yen link clear during the campaign when he characterized monetary ease as a form of currency manipulation. Similarly, Abe’s second arrow, massive infrastructure spending, is little different from past policies. Forever the LDP has turned to infrastructure spending, sometimes to help the economy but always to reward regions and contractors that support the party. This lavish spending over years, and the budget deficits used to support it, explain why Japan’s public debt outstanding now stands near 260 percent of the economy’s gross domestic product (GDP). The chronic use of infrastructure spending also explains the old saw that the rivers of Japan almost all have concrete beds. The continuity with the LDP’s past is also clear in the party’s ready acceptance of its predecessor’s sales tax increase. Its offer to offset the tax’s adverse economic effects with still more infrastructure spending shows how it plans to continue its old practice of using the taxpayer’s money to pay off its political obligations. Though these policies worked well from the 1950s and into the 1980s, they have failed consistently since, and they will fail again unless Japan deals with its fundamental structural problems. It is these structural stresses that have held Japan back for two decades and that have thwarted the impact of once-effective policies. Abe’s third arrow, which proposes to deal with structural matters, is the only thing really new thing in Abenomics. But so far, he has offered little. To be fair, the prime minister, by acknowledging the need for fundamental reform, goes beyond any prime minister to date. But he will need to do more than acknowledge and talk. To have effect, he must make a substantive move. Two areas in particular need attention. The first is Japan’s innovation deficit. The list of reasons for this problem is long, but at the root of much is the economy’s rigid, top-down approach to economic decision making. Famously called the “iron triangle,” to describe the close cooperation between politicians, government bureaucrats, and big business, the arrangement once worked well. It marshaled Japan’s economic and human resources to follow directions set by more advanced economies, the United States in particular. It began to fail, however, as Japan caught up to the West in the 1980s and 1990s. Then, with no one to follow, the country needed more economic experimentation and innovation. Since these activities do better in a decentralized environment, the iron triangle changed from an asset to a liability. But it has remained in place. While Abe has stressed the need for change, using the word innovation frequently in his speeches, so far he has only floated vague remedies and done nothing substantive. The aging of Japan’s population has compounded these structural problems. According to the latest statistics, Japan today has a population in which one in five is 65 years or older. With barely three people of working age for each retiree, the financial strains are obvious. There are simply too few people contributing to pension plans, public and private, to pay for the relatively large retired population drawing on those resources. By limiting the relative number of workers in society, these demographics have also limited Japan’s production and growth prospects. 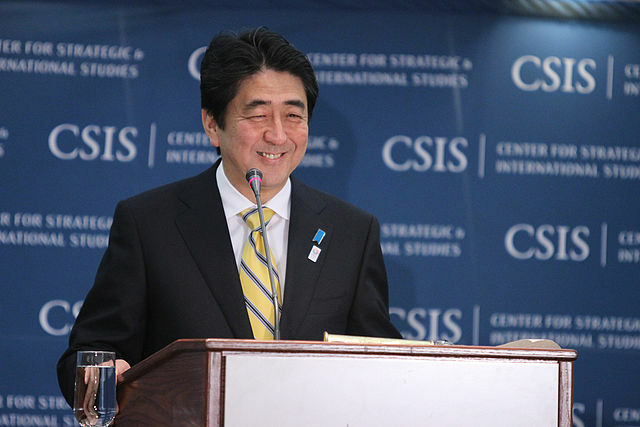 On these matters, Abe has talked a good game, better than his predecessors. He has stressed the need for increased productivity and efforts to bring a greater number of older people and women into the workforce. This last change, if it could be affected, has great potential, since Japan has remarkably low workforce participation rates of elders and women. But as with innovation, the prime minister’s efforts thus far have been more rhetorical than substantive. Indeed, many of Abe’s other policies run directly counter to these fundamental structural needs. Take for instance his efforts to promote exports by driving down the foreign exchange value of the yen. It is simply preposterous to expect an economy where one in five has retired from active production to compete as the workshop of the world, especially against China. If anything, Japan should be turning away from export promotion. It might even do well to raise the yen’s value so that imports can supplement the efforts of its relatively limited work force. The decision to raise sales taxes, too, compounds these fundamental problems. The tax burdens consumption when an economy with such an inordinately large proportion of retired people, that is unproductive consumers, should be substituting consumption for exports as an engine of growth. There is still time. Japan’s structural problems are long-term by nature. Abe, understandably, may see a need to prepare the ground before loosing this third arrow. It is, after all, the most socially wrenching and politically fraught of his three arrows. But until the government in Tokyo begins to make needed structural moves, little in Abenomics suggests that the recent economic improvements will have any durability. Without this third critical arrow, Japan’s economy will relapse into stagnation, as it has so many times during the last twenty-plus years. Milton Ezrati is senior economist and market strategist for Lord, Abbett & Co. and an affiliate of the Center for the Study of Human Capital and Economic Growth at the State University of New York at Buffalo. He is the author of Kawari, a book about Japan’s economic and financial challenges. His new book, Thirty Tomorrows, linking globalization to aging demographics, is forthcoming from Thomas Donne Books of Saint Martin’s Press.